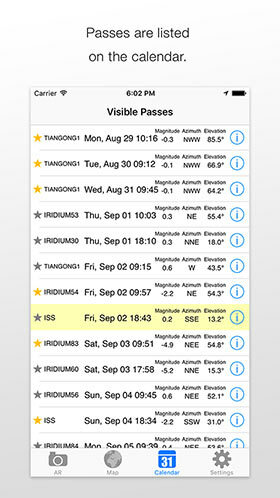 Most intuitive satellite tracker to sight International Space Station(ISS), Iridium flares, Tiangong and others using AR, augmented reality technology. What can I do with SpaceStationAR? 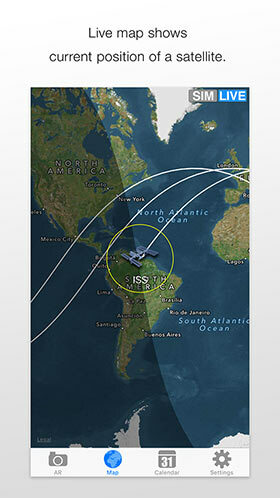 SpaceStationAR is your best reliable and easiest satellite tracking tool using augmented reality technology. Which satellites does it support? 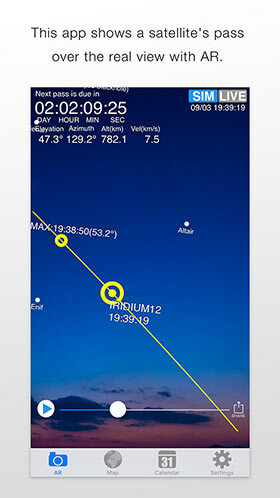 This app is intended to support watching satellites with naked eyes. Large satellites, such as ISS (International Space Station), Hubble Space Telescope, Tiangong 1 (Chinese space station) and Tiangong 2 are listed. 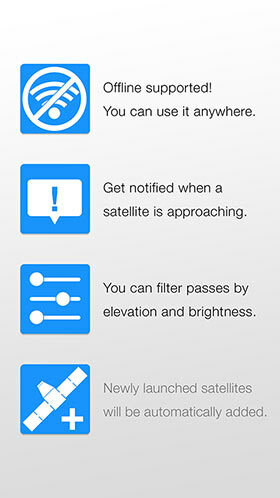 Newly launched satellites will be automatically added to the app. 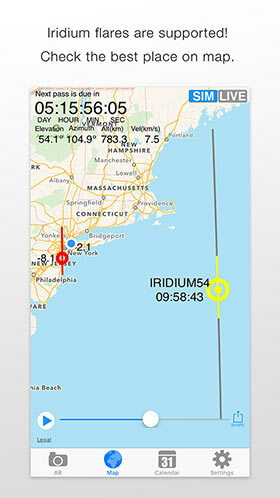 Flares of Iridium satellites are also supported in PRO edition. When can satellites be seen? Space Station rotates around earth in every 90mins, but we rarely can see it because it's in darkness or surroundings is too bright with sunlight. SpaceStationAR predicts only when satellites are in sunlight, earth is in darkness at the same time. So it's usually dawn or sunset. There is almost no problem to find satellite. We do best not to exceed azimuth error more than 15 degree and time error more than 10 seconds. Error tends to be larger when it passes higher. Do I need any equipments to see satellites? In case of the Intl Space Station(ISS) or Space Shuttle, you need nothing. ISS is now the brighter than any stars in sky and if you can find single star in sky, you can find ISS too with naked eye. How can I find Satellites? They fly as fast as plane but it's easy to distinguish. A satellite doesn't blink! It brights more when it passes higher. My device doesn't support hardware compass. iPhone 3G and iPod touch doesn't support hardware. Don't worry, you can adjust the heading by flicking the display. The "Manual compass" mode is also useful for iPhone 3GS users when accurate heading can't be obtained. I can't obtain my location on iPod touch. iPod touch doesn't support GPS. iPod touch obtains location information by accessing Wi-Fi hotspots. Please use this app near Wi-Fi hotspots which support Skyhook Wireless. For further information, please refer Skyhook's official contents. I concern about my privacy using Twitter in SpaceStationAR. When SpaceStationAR shows your tweet in camera mode as you can see others, it obfuscates your location and protect zooming too much at map mode. Does SpaceStationAR send device ID? UDID (device ID) is required for the service of SpaceStationAR. Before it send your UDID to the server, an alert dialog appears. Please select wether you agree sending UDID or not. Turn on your device and it will show AR again without connecting! This application requires the internet connection. So please check your condition first. Next try memory release(push home button longer than 10 seconds). iPhone3G is easy to freeze with background music. If you have crash log or know how to crash, send them to us and we will fix it as soon as possible. I find bug or request. Developers and users of SpaceStationAR discuss on Twitter using hashtag #SpaceStationAR. Latest develop tasks are listed in Google Doc. Please refer them first and report anytime. We will reply as soon as possible. If you're not Twitter user, just send to me and will be replied soon. We're Toriningen Inc in Tokyo,Japan. Only but funny 2 geeks, @hisashin and @MaripoGoda are its members. We enjoy building things everyday and will be happy to hear your impression about this app via Twitter or mail.